With the glut of saccharine holiday entertainment going around, it’s refreshing to catch a more genuine offering, and Washington National Opera’s newly commissioned holiday work, “The Lion, The Unicorn and Me,” gives us a delightful break from all the tinsel. While composer Jeanine Tesori’s opera doesn’t always rise to its promised heights, the story of a self-effacing donkey charged with carrying the Virgin Mary to Bethlehem is a go-to for anyone looking for holiday magic. As director Francesca Zambello, a lesbian, announced on opening night, this was the first time in WNO’s 58 seasons that the company is premiering a new work composed by a woman. Tesori, a four-time Tony nominee for composition, often brought a light ironical touch to her score, yet the music also broke out into moments of stunning lyricism. The Unicorn’s first act aria (ravishingly sung by Jacqueline Echols), as well as the Donkey’s introductory piece (in a great singing and acting performance by John Orduña), brought out the deeper tones of Tesori’s evocative skill. Too bad, then, that a lack of consistency nagged the work as a whole. The first act, featuring a child angel played by the sparkling Henry Wager, was almost perfect, but the one problem spot became a touchstone for the work’s greater inconsistencies. 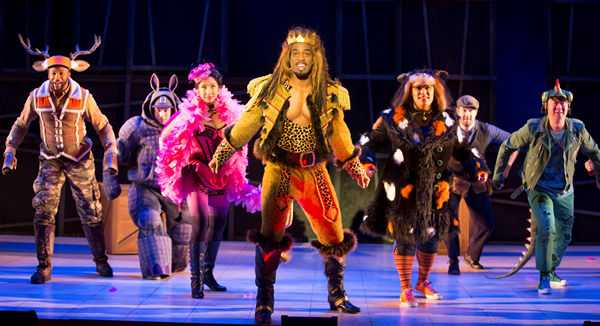 In a troublesome sequence, the blustering Lion, brashly played by bass Soloman Howard, strides onto the stage in a jungle-motif militaristic costume accompanied by photographers and begins his appropriately arrogant aria. Suddenly, the piece takes flight with drums, a backup chorus (including the audience) and a melody that causes the heart to jump. And then it dies on the vine. Sadly, the same thing happened with act two. What started off with such promise in the first half lost its steam in the second. The opera seemed to suffer from a lack of focus in music and plot, becoming slightly redundant, before rallying for an inspiring end. However the beauty of the story prevails overall, helped along by a moving libretto from gay poet J.D. “Sandy” McClatchy and an exciting production from Zambello. As told here and in Jeanette Winterson’s original book on which the opera is based, an angel needs to find the right animal for the holy job of getting Mary to that legendary stable, and all the creatures in the world apply. Costume designer Erik Teague smartly avoids the obvious, opting instead to mix animal characteristics with modern sartorial symbols — the glamorous Unicorn hoofs it in Lady Gaga’s famous heel-less boot and a ponderously slouchy hippo wears a hoodie and baseball hat. The children’s chorus, beautifully on pitch and absolutely charming whether playing sheep or a menacing snake, rounded out a solid cast of adult ringers. Ian McEuen’s lyric tenor and Wei Wu’s incisive bass complemented their engaging performances in supporting roles, while mezzo-soprano Catherine Martin sang luxuriously as Mary (although her rough handling of the baby Jesus was enough to make one wince). So if Tesori’s first crack at her opera needs some tweaking (as have countless premiered works before it), there’s still plenty of enchantment to engage audiences of all ages. The children present on opening night laughed loudly and clapped excitedly as various animals pranced across the stage or Mary gave birth to that oh-so-special child, but it wasn’t just the kids who were swept up in the story. In a season that often feels overblown and out of touch, the tale of a simple person discovering the gifts that lie within him feels like the best holiday present of all.